KATHMANDU, Nepal – Six months after arriving in Nepal, Miyamoto International has established a permanent operation here with a local engineering partner, Tech Design, announced Miyamoto CEO Dr. Kit Miyamoto. The earthquake structural engineering firm landed in Kathmandu three days after the M7.8 quake devastated the country in April. Damage assessments on more than 1,000 structures have been completed while Miyamoto also oversees several dozen repair and retrofit projects for private and public organizations. Miyamoto also assessed many homes and schools in the mountainous rural villages at no cost, is retrofitting its first school and led the assessments of popular trekking areas. Capacity building remains a top priority as progress is made toward building a more seismically resilient Nepal. Miyamoto also provides the commercial and public sectors with high-performance engineering. In Kathmandu, for instance, the Nepal office is working with The Chaudhary Group to retrofit its earthquake-damaged headquarters. The company was advised to tear down the building, but Miyamoto analyzed the structure and provided a retrofit solution, adding reinforced concrete shear walls strategically placed alongside exterior walls. This is a cost-effective solution that also brings the building up to international standards for life-safety performance. 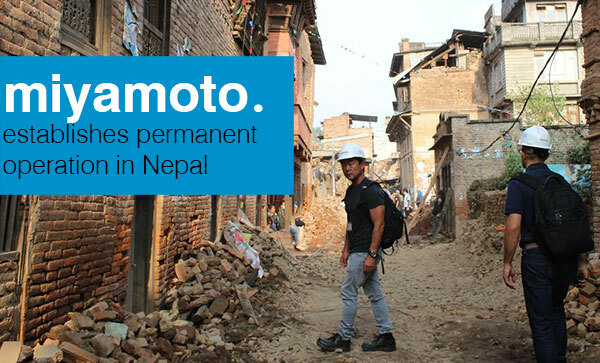 The firm’s nonprofit Miyamoto Global Disaster Relief also is committed to help repair and retrofit damaged schools. These include the red-tagged Nuwakot School, which Miyamoto is retrofitting with the help of Round Table, another charitable partner. Miyamoto’s approach includes training masons, builders and engineers to international standards, which helps local communities for generations to come. Miyamoto International also conducted damage assessments of Nepal’s iconic trekking routes, including the Annapurna Circuit. A short video highlighting that project is here. For damage assessment, repair and strengthening work, our Nepal office can be reached at skast@miyamotointernational.com.